I wrote this for a magazine last year, don't think it was published. It is damn certain this information needs to get out there though. So here goes, take a hard look at this and an even better one at your gear, ROUTINELY. Hybrid or flat kites have brought great performance to kiting such as easier management of reasonable wind gusts, floaty jumps and rapid lessening of kite power in emergencies. Aside from all that, hybrids may be associated with something much more important, fewer fatalities. It is too early to say with certainty but the current indications are encouraging. Can you still kill or maim yourself with a hybrid kite? Absolutely and fairly easily too lacking training, rigging it improperly or going out in poor conditions in particular. Gear failure due to inadequate inspection, preventive maintenance and replacement is yet another way of getting into trouble. Bridle tangles on launching is yet another way things can go bad. “Got to use your head dodo” as has appeared on the wall of a favorite local eatery for many decades. A violent high wind accident happened with a hybrid kite after the initial submittal of this article. A very experienced rider though new to hybrids assisted by similar kiters launched a hybrid with a bridle wrapped around a wing tip. An accident followed that easily could have been fatal. The kite spun fully powered downwind and failed to depower even when he dropped the bar. The kiter (and a helper for part of the way) were dragged 150 ft., hit several objects including breaking a 4” x 4” wood post in half with his shoulder. Another rider grabbed one of the lines of the momentarily stationary kite, severely slicing a finger when it suddenly relaunched again. Kiters and helpers must fix these problems on preflight and don’t grab kite lines! All a hybrid kite potentially allows you to do is reduce the kite power, if it’s properly configured, you react properly, everything works as intended and winds are not too strong. The “magic depower” may not happen if it is rigged improperly or the wrong thing breaks. Still for whatever reasons, there have been few kiter losses with hybrids to date with the vast majority having been on C kite designs. It is possible that newer C kite designs with more substantial depowering adjustments may also show fewer losses. What could derail this encouraging trend? Perhaps the very thing that has brought the benefits in the first place, all that bridling and pulleys. This aside from ever present “operator error” (see above), perhaps age induced gear malfunctions could increase incidents and accidents in older and second hand hybrid kites. Snagged and broken bridles, seized and broken pulleys on hybrid kites sometimes but not always result in spinning, out of control and powered up kites. Something like this can happen with normal aging of kites and can really mess you up and/or your kite if it happens. Preventive maintenance of kites and careful inspection of used kites are key. It is possible that these type of incidents and accidents may increase with the quantity of older and used hybrid kites out there. Pulleys don’t have to seize to cause problems, just impaired movement will heat up and wear bridle lines substantially. This could cause early bridle failure. 1. Avoid bad choices or “operator error.” (i.e. kiting without adequate training, rigging errors, squalls, rigging too big, bad launch/landing areas, inadequate buffers, flying in conditions beyond your abilities, etc.). 2. Regularly rehearse dealing with high wind emergencies. (i.e. sheeting out and/or dropping the bar IF that is what the manufacturer recommends). Know what your kite manufacturer recommends in high wind emergencies and practice it under lighter wind, controlled conditions. Act early. Extended kite spinning resulting in binding lines may impair the ability to depower hybrid kites. 3. Do NOT engage stopper balls if near shore or when jumping to try to avoid problems with bad landings. If you lose it with a stopper in place you are throwing away all those great and costly hybrid kite depowering characteristics. 4. 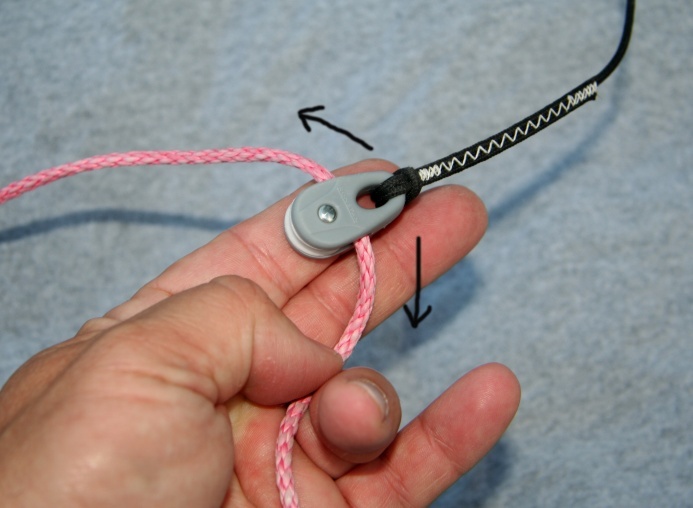 Know where your kite leash attachment is and regularly practice finding and releasing it with a safe downwind buffer. If a bridle breaks or pulley locks up this may be your only choice short of being lofted and dragged into something. 5. 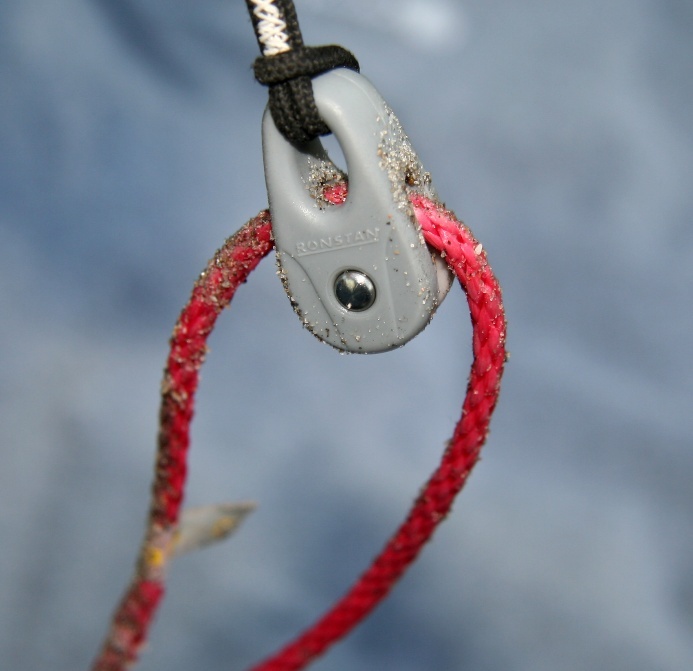 If your lines, bridles, pulleys, pigtails, kite or other gear is worn, repair or replace it before flying. Kiting can place tremendous loads on gear causing sudden failures with minimal warning. 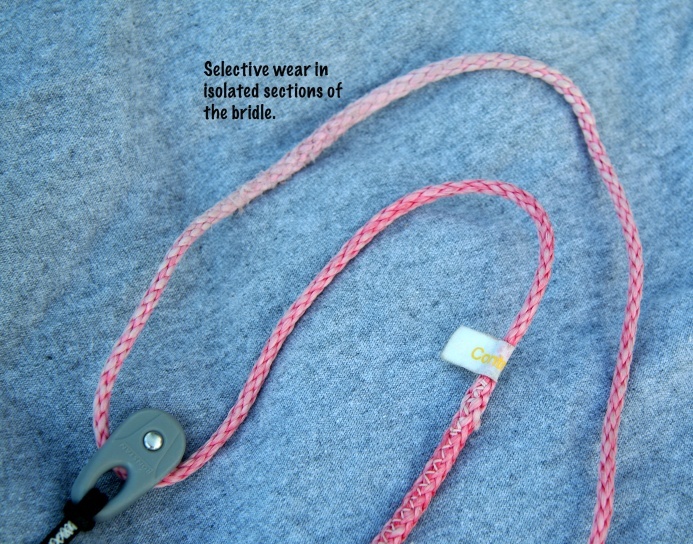 A example of uneven Spectra bridle line wear. 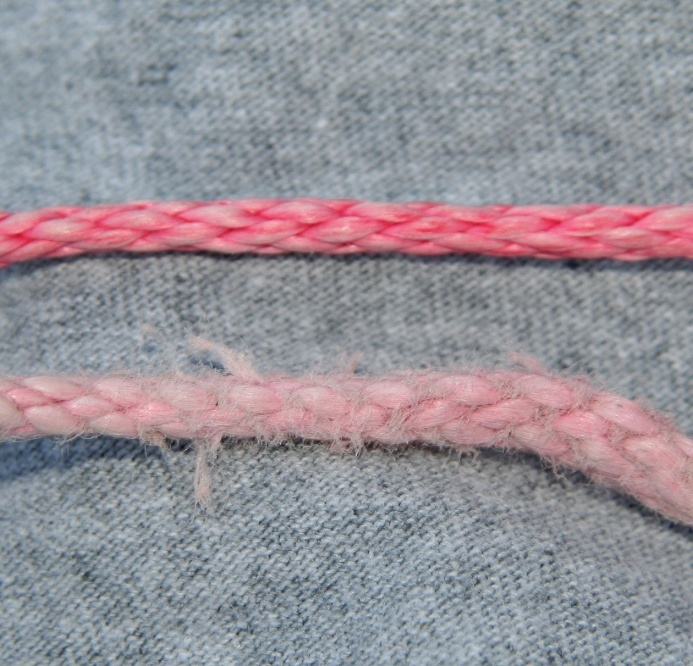 Ok (top) vs. worn (bottom) Spectra bridle line. 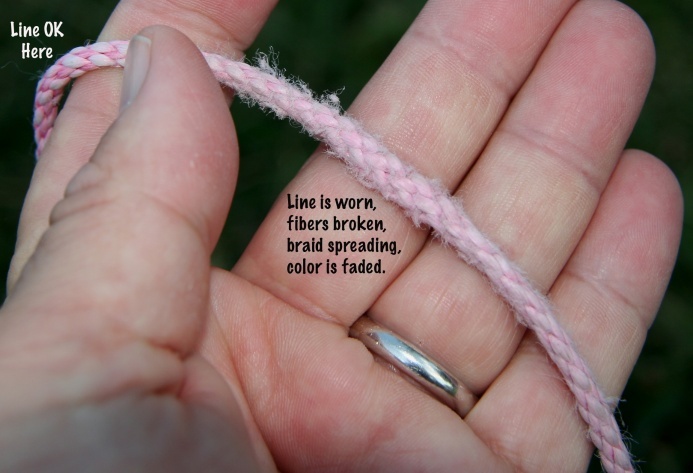 Note faded color, broken strands, loosened and enlarged braid in worn lower line. 6. Do not fly your bridles and pulleys covered with sand. Avoid premature wear and failures. Wash free of sand before flying and with fresh water after. What about Preventive Maintenance or PM? It is a given that there will be more downed kites with problems and perhaps some riders too if regular PM is not performed on hybrid kites. I spoke to many manufacturers about kite PM in assembling the following points. 1. EXPECT TO REPLACE bridle lines and pigtails about every 6 months, perhaps longer depending upon wear. Inspect bridle lines, replace them if excessive stray fibers are present, the diameter changes much or if much color loss has occurred. 2. Push the bridle sleaving together and closely examine for wear in the core area. 3. Pull the bridles back and forth through the pulleys to verify free movement before each session. Wash pulleys off with fresh water after use. Check all pulleys for movement, wear, binding, etc. prior to each session. 4. Consider using Teflon Dry Lube on pulleys to improve movement and reduce corrosion. Dry Lube is less prone to causing sand to stick than normal oils. 5. Chicken loop line breaks eventually can occur. You can increase the term of use of this line by rubbing an unlit candle over it. 6. Inspect bridle attachment nylon webbing at the kite for excessive wear. 7. Inspect your spreader bar for bends or cracked welds. Do not use aluminum spreader bars for kiting. They have broken in the past under routine kite loads. So, enjoy the gains that the new kite technology continues to deliver. Just be sure to take good care of your gear so that it is there to take care of you. If not, it is pretty much guaranteed to fail on you someday, perhaps when you can least afford it. PM has become even more important with hybrid kites than in times past. Special thanks to Garry Menk, Paul Menta, Kent Marinkovic, Thomas Gaehwiler and others for their excellent input for this article. Are folks looking for things like this during routine preflighting and PM checks?